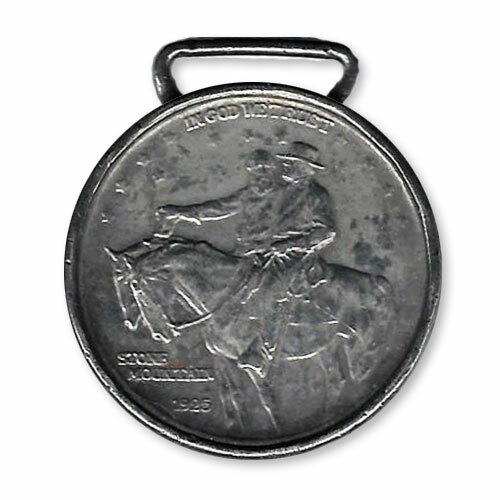 Exonumia is defined simply as numismatic items such as tokens, medals, or script other than coins and paper money in the Merriam-Websters' dictionary. It first came into use in 1962, so not a historical term within the hobby. For most coins this would be an interesting list of small items, articles, or memorabilia associated with the collection. But for the Stone Mountain half dollar this could be an inexhaustible list of items because of the association with the monument and park. Even though a Georgia State Park, there are souvenirs, train tickets, post cards, snow globes, and on and on. For our discussion we will limit any items that come into our possession to items of historical importance that are associated with the carving project and to items we believe to have been from the period and made in association with the carving or organizations closely aligned. To do otherwise would have the exonumia take over the site because there could be hundreds of thousands of such items. 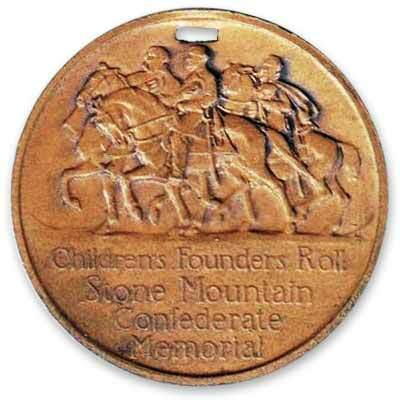 This medal is from 1924 and is just one used to help raise funds for the carving. School children could purchase these and would then have their names entered into a book to be kept in the proposed Memorial Hall. Like so many things associated with the carving, this one is almost like it but not quite right. You can tell it is from the Borglum era because Jackson is first, followed by Lee and Davis. But Jackson does not have his hand extended as in Borglum's conceptual models. Also Davis is in the foreground and not the background. 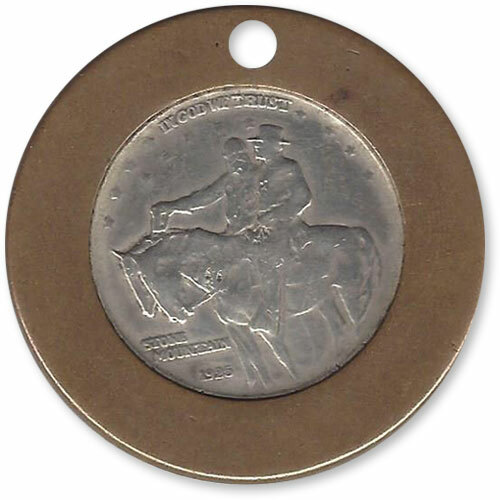 The medal was struck by Whitehead & Hoag in New Jersey, and bares Borglum's 1924 copyright. Issues like this one might have seemed insignificant at the time, but when Borglum and the SMCMA split his copyright on such items helped back up his claim to the models he destroyed. The UDC hoped to sell 1,000,000 of these in their fundraising efforts with children, a figure that was likely unattainable even in the best of times. There is a subtle change in wording where the word "soldiers" has been changed to "people." We assume this was a part of the sales campaign to be more inclusive of children and noncombatants. 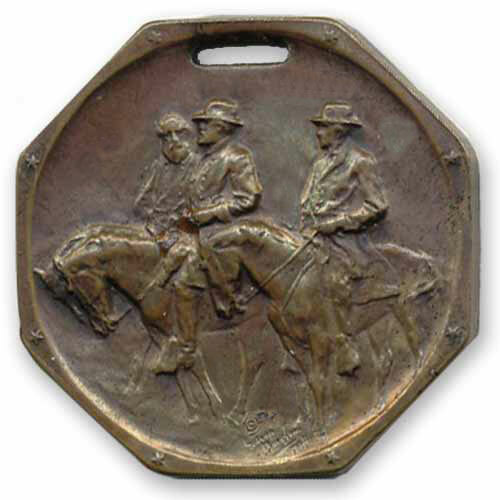 This medal can be dated to the post Borglum era on the project. The carving is the Lukeman concept with the riders rearranged and with hats off. 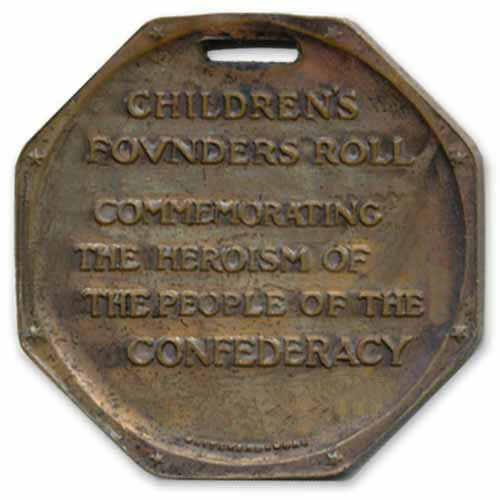 But even at this stage the UDC had not given up on the concept of the Memorial Hall and was still selling small medals to children to get their names on the honor roll. 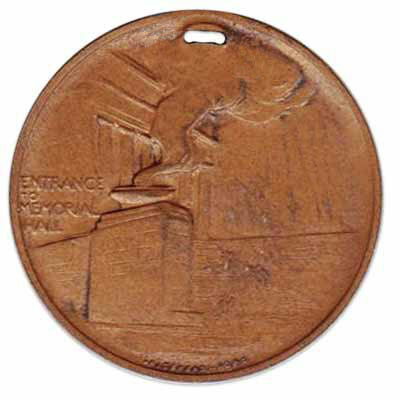 The reverse of the medal shows a conceptual view of the Memorial Hall with what looks like an eternal flame. Since the Memorial Hall was conceptual only this is obviously not a depiction of a real place. The SMCMA also created some of these medals with UDC and a date in their sales efforts. We have also seen counterstamped examples that closely parallel the counterstamped coins, but with a State abbreviation and date, but no serial number. These were also created by Whitehead & Hoag in New Jersey. 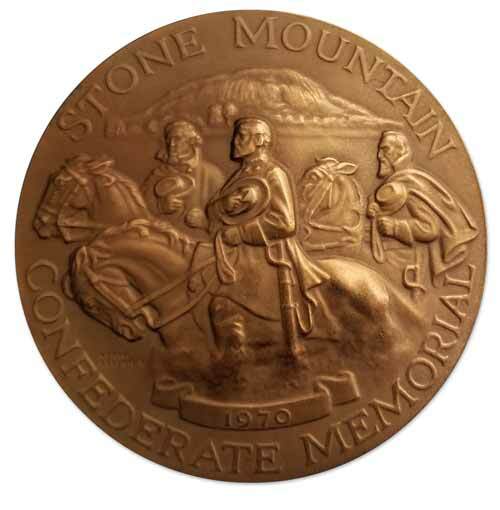 This art medal was authorized by Congress in 1970 and used to commemorate the completion of the carving some 46 years after its start. 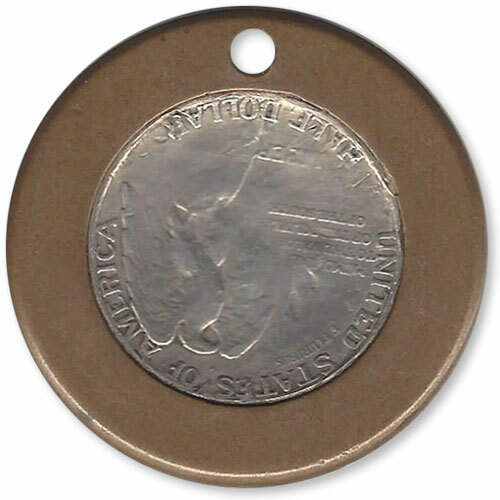 It was issued as a three coin set with two silver and one bronze coin of two different sizes. 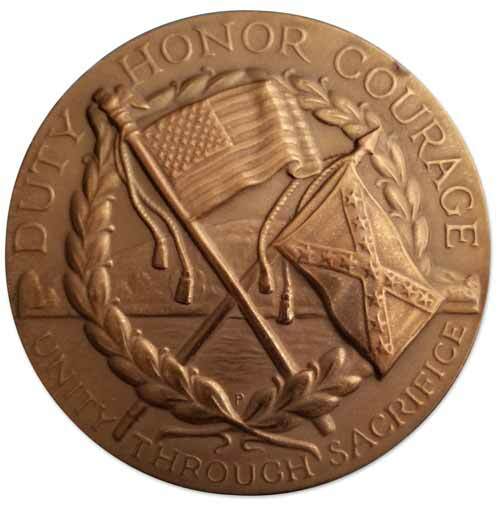 Later medals were created in bronze in the smaller size, but not under Mint control. All of these are of the same design and feature the carving in its final form. We picked up this item from eBay only because of its age and it has the appearance of a personally worn older item. Apparently someone had a coin made into a necklace with a plain brass bezel. It does not appear to have had any special designation or use other than jewelry. We picked up this item from eBay and it appears to have been worn with a ribbon of some kind. Our best guess would be something associated with the U.D.C., the S.O.C.V., the S.M.M.A. or the S.M.C.M.A. But without the ribbon or another one for comparison its actual use will probably remain a mystery. 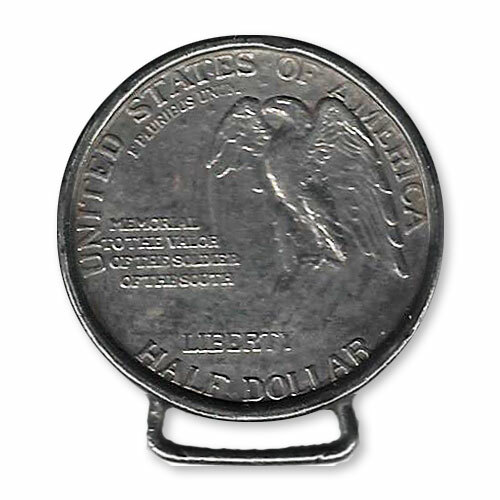 This holder shows the lengths that the committee went to in an attempt to sell all the coins. There was a report of a wealthy financier in New York purchasing 10,000 coins for distribution. However, we have not been able to establish a connection between the hotel and the SMCMA. Named for President Teddy Roosevelt, the Roosevelt Hotel was opened in 1924, so the sale or gift of the coins could have been a promotional effort for the hotel and not the coins. The hotel is located right across the street from Grand Central Station so it has been a prominent landmark since it was opened.